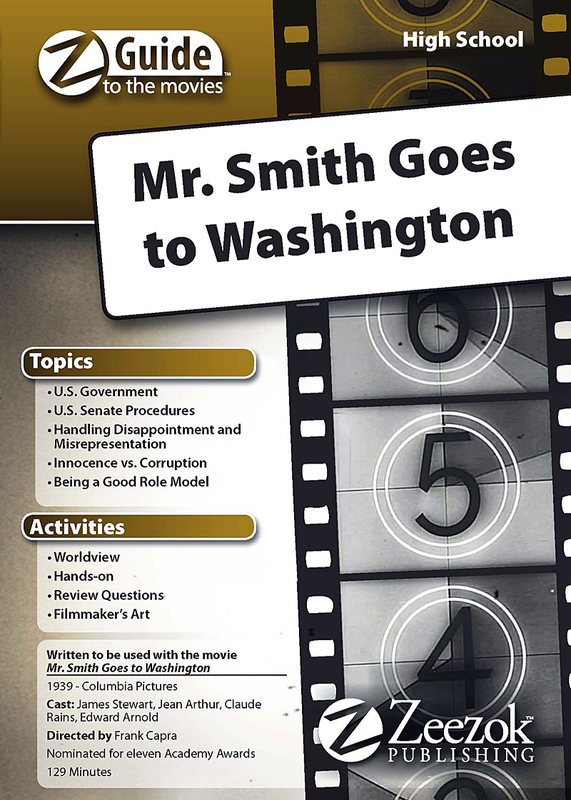 Zeezok Publishing's Z-Guide to Mr. Smith Goes to Washington is a great way to incorporate media into your social studies curriculum. Designed for the high school student the Mr. Smith Goes to Washington guide builds upon the films theme of a crusading senators stand for truth. With the help of his secretary freshman Senator Jefferson Smith stages a filibuster in a valiant effort to expose the corrupt Taylor political machines influence on Washington D.C. politics. A "David vs. Goliath" classic based on the timeless theme of liberty and justice for all Mr. Smith Goes to Washington should be required viewing for every American citizen. This guide contains a topic overview movie synopsis and ten learning activities for an in-depth study of the film and Congressional procedures. Learn more about the filibuster with our guided research project. Develop your writing and debate skills produce an art project complete a crossword puzzle and review the process of how a bill becomes law. Probe the directors mind with The Filmmakers Art activity and get the entire family involved with the "For Family Discussion" section at the end of the guide. Choose those activities which best fit your students course objectives areas of interest or time schedule. Note: Popcorn and movie not included. Movie Summary: A small-town idealist Jefferson Smith (James Stewart) answers the call to duty when hes unexpectedly named to fill a vacant seat in the U.S. Senate. Determined to do some good he sponsors a bill to create a national boys camp unaware it threatens to undermine a graft scheme sponsored by his home states crooked political machine. Framed and threatened with expulsion Jefferson takes to the Senate floor where he attempts to prove his innocence in one of the most rousing climactic scenes in screen history. This Z-Guide is based on the movie Mr. Smith Goes to Washington (1939). You can view a trailer for the movie below.